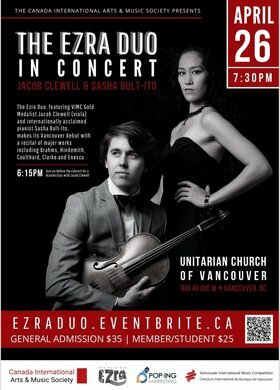 The Canada International Arts and Music Society is pleased to present award winning viola and piano duo, The Ezra Duo in concert. 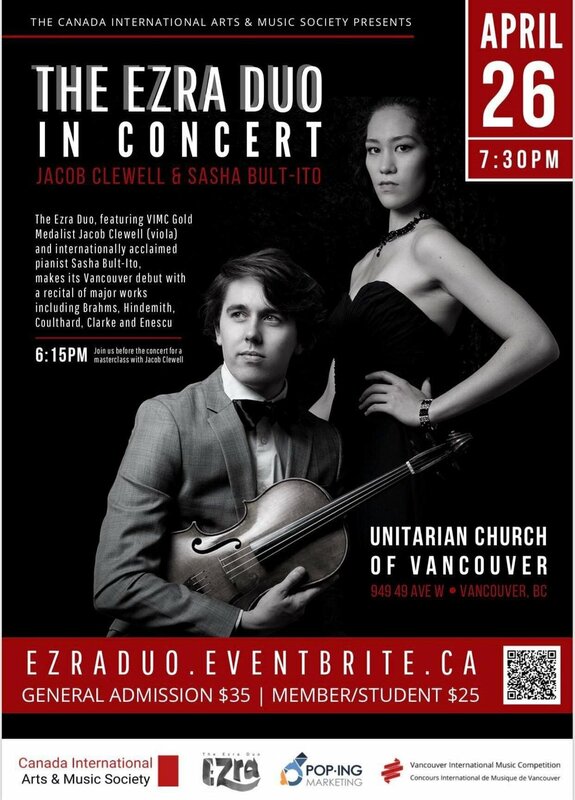 Both individually accomplished and renowned as an ensemble of the highest performing caliber, Jacob Clewell (Viola) and Sasha Bult-Ito (Piano) formed "The Ezra Duo" in 2016, premiering their work in 2017 in a prelude concert for the Royal Conservatory Orchestra in Koerner Hall (Toronto). After performing in the esteemed Carnegie Hall (2017), the duo competed and took first prize in numerous competitions, earning them invitations to perform in New York, Vienna, and Sarajevo. Highlights from the 2018-2019 season include re-engagements at the Arts and Letters Club of Toronto and Prime Chamber Music Society, a guest artist appearance with the Rome Symphony Orchestra (Georgia), and a tour featuring their Women in Music program through the southern United States and Ontario, Canada. Join the Canada International Arts and Music Society and the Ezra Duo for a spectacular display of virtuosity through repertoire spanning the centuries!